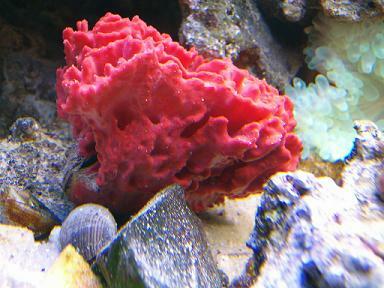 OK here's the situation, bought a cool red sponge a week or so ago. It's growing on a clam shell. just realized today the clam is still in the shell. I didnt notice this until i tried to move it only to see the rock it was sitting on lift with it, the clam has anchored its foot to the rock, and the sponge moved slightly when i tried to move it. Now as the sponge has grown entirely over the clam it cant open very far, but it has obviously survived long enough for the sponge to grow this far. I am wondering if I should bisect the sponge along the line of the shell to try to save both or just leave them alone. Anything i have read suggests that cutting a sponge is fine, but other opinions would be welcome. if it were me i would slit the sponge to try and keep the bivalve alive, this is more common than you would think. Well I've been watching it closely for a few days and I think I'm going to leave it alone for now. The clam is able to open a little more than 1/4" and the sponge didn't get that big overnight so it's been surviving this long. I don't want to cause the death of either but I did buy the bright red sponge and inherited the ugly clam with it ;P So I pick sponge But hopefully they will both continue on as they are. please help with lighting dilemma!